We recently established that the Hollywood Brown Derby (at least the one in Disney’s Hollywood Studios) has an embarrassing version of the Cobb salad. This is unfortunate, since the origin of the salad can be traced back to the original restaurant. Let’s see a show of hands. How many of you have seen the episode of Seinfeld called “The Maestro.” It’s season 5, episode 3. 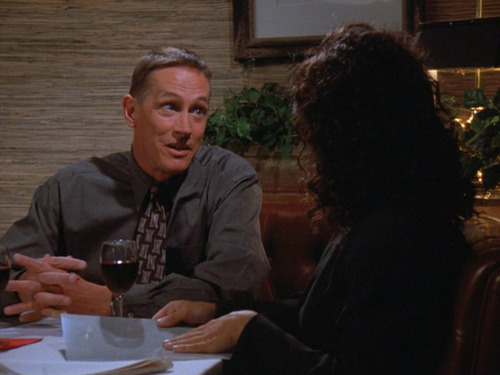 Well, anyway, in this episode, written by Larry David, Elaine is dating an orchestral conductor who demands to be called “maestro.” An interesting fact we learn during the episode is that The Maestro’s real name is Bob Cobb. I don’t think it’s a coincidence that Larry David decided to name a character who basically wants to be considered a master “Bob Cobb.” And I don’t think it’s a coincidence that David later decided to use the matter of the origin of the Cobb salad as the basis for a Curb Your Enthusiasm episode. I think David is trying to tell us that the Cobb salad is something that commands a little respect. I mean, if you google image search “Cobb salad”, it takes quite a bit of scrolling before you come across an image that doesn’t look appetizing. My understanding is that the components of the Cobb salad couldn’t be simpler. There’s even a mnemonic to remember what’s in the damn thing! EAT COBB: Egg, Avocado, Tomato, Chicken, Onion, Bacon, Blue cheese. One thing is for sure, the damn salad has been around since 1937. So I want to know, if the best Cobb salad you can order in a restaurant can’t be found at the Hollywood Brown Derby, then where can it be found? This is a serious question. I want some first hand information. I want to know where you’ve had a Cobb salad. Has it been great? Was it terrible? Have you noticed a Cobb salad on a menu somewhere and never ordered it? Basically, I want restaurants (anywhere) that serve Cobb salads on my radar, because there have to be places paying tribute to the legend the right way. The Cobb salad at The Local in Saratoga and at Illium in Troy are really good. I think you have to order chicken on top though at Illium, it doesn’t come with it. In NYC , Sardi’s does a fun tableside prep I think you’d enjoy.